We were bracing for a disaster. That is how everyone was referring to September 11, primary election day -- as "the next Florida" and a disaster in the making, though looking back now that description is enough to make anyone wince. At the time, though, what many feared was that last November's electoral mess in Florida would be repeated in New York. The city's Board of Elections would be unable to do anything about jammed or broken voting machines, missing name s on voter registration lists, inadequate help at the poll sites. It would be unable, in short, to pull off the election. Then the Twin Towers fell and the election was called off. The problems in the voting process dropped off the list of the city's priorities. On one hand, the primary and runoff went smoothly because of a relatively low turnout of 790,000 voters, which is substantial for a primary but low compared to the 2.2 million voters in the November 2000 Presidential election. The voting process was also made smoother by several steps taken both by the city and by civic groups, according to Gene Russianoff of the New York Public Research Interest Group. The city hired more voting machine technicians. The mayor raised the pay for poll workers from $130 to $200 a day. The mayor and the governor created two separate election task forces. Groups like the City University of New York and Citizens Union Foundation recruited more than 3,600 new poll workers. On the other hand, two days after the mayoral runoff between Mark Green and Fernando Ferrer, the Board of Elections announced that there was an "overcount" of votes -- in other words, some votes were counted twice -- and that it could only offer "an educated guess" about the real result. Fernando Ferrer's supporters called for a federal investigation of election fraud, the Board of Elections blamed the press, claiming the "incorrect work was performed by others," and Mark Green had to wait eight days for a final concession from his opponent. 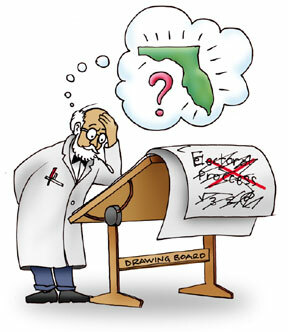 It may not have reached the level of the "Florida debacle," but it pointed to serious problems in the system. Last week, 25 civic groups drafted a letter to the governor calling for the approval of funding for new voting machines. "In the wake of the World Trade Center tragedy, the city Board of Elections has done some extraordinary work," the groups said. "But their efforts have been greatly hobbled by a system that uses lever machines, which disenfranchises significant numbers of voters." Until the old machines are replaced, more technicians are hired, and poll workers are better trained, these groups argue, each election in New York City will be "another Florida." Two days after the runoff, Mark Green's 52 to 48 percent victory over of Fernando Ferrer was in question. The Board of Elections first estimated that there may have been an overcount of 200,000 votes, but that was later reduced. It did not take long for chants of "Florida" to emerge from the Ferrer camp. "This is a question through which we all lived through seven weeks last year [in Florida], and here we are in New York City with precisely the same experience," said former Manhattan Borough President Ruth Messinger, a Ferrer supporter. The overcount, the Board of Elections said, resulted when 2500 election districts were consolidated because there were not enough voting machines. In the count, the number of machines were doubled erroneously. However, there are plenty of opportunities for error in the New York City election system. To tabulate results, an election inspector reads the count from each voting machine to another inspector who writes it down by hand. A police officer then drives the numbers to a local precinct where they input the numbers into an antiquated computer system. The numbers are then tabulated by a news organization and sent out to the press. At the heart of the problem are the city's 40-year-old lever machines. "The state needs to move quickly to improve the voting machines," said Gene Russianoff . "What happened in the runoff reflects the city's single biggest problem. They basically screwed up the vote count." The city's 6,800 mechanical lever voting machines have four disadvantages: they are old, too few, difficult to transport, and too confusing. The city uses 3.2 Shoup machines that are no longer manufactured. Only a limited number still exist throughout the country. When a voting machine needs replacement parts, other machines are disassembled to create spare parts. The 1,000-pound machines are also cumbersome and must be loaded onto trucks and transported to each poll site, often losing or breaking parts in the process. The machines are also confusing and not easily adaptable. Before the primary, Governor George Pataki said if he lived in the city he would write-in Rudy Giuliani's name, but the governor obviously did not realize the write-in mechanism on the machine is difficult to find and many poll workers do not even know how to instruct voters to use it. Of the more than 1,000 calls that the New York Public Interest Research Group received from voters with problems during the primary and the runoff, many had to do with the write-in category. "The poll workers had virtually no idea of how to use the write in mechanism," said Russianoff. New York City's current plan for getting new machines is to wait for other cities and states to modernize their voting machines, and then buy their old and discarded ones. Although the primary and runoff were delayed by two weeks, the November 6 date of the General Election remained the same. This schedule, much to the dismay of Gary Berzansky, Director of Equipment, meant that the technicians responsible for resetting each voting machine, had to work frantically just to pull off the election. Even before the terrorist attacks and the additional problems it created for the Board of Elections, whose main headquarters are just several blocks away, the technicians had been working for weeks without a day off. They continued to do so in preparation for the General Election. Although they had the money the Board of Elections failed to hire 17 new technicians it needed for this year. Six technicians were flown in from Chicago at the recommendation of the Mayor's Task Force on Elections. The City University of New York's work experience program and the Central Labor Council also found mechanically inclined individuals to help with the less technical work such as placing the levers on the machines and sealing the ballots. More than 30,000 poll workers -- who work from 5:30 a.m. to 9 p.m. -- are needed to conduct a city election. Last year, the Board of Election was 4,000 workers short. In response, this year the mayor increased the daily stipend from $130 a day to $200. Citizens Union Foundation and City University of New York recruited 3,600 new poll workers. The New York Immigration Coalition recruited an additional 300 bilingual inspectors. The Board of Elections, however, never contacted many of these people. Of those who were contacted, many said they did not receive adequate training. Estelle Greco, a new poll worker who worked in Manhattan on the September 25 primary, said her three-hour training was too short and that during the class the voting machines were never even opened. When Greco arrived at her poll site at 5:30 a.m. she said, " I couldn't do anything because I did not know how to open the machines." A Queens poll worker, Harold Rodriguez, found many of his fellow workers were giving out misinformation to voters on September 25 when their name did not appear on the voter registration list, because the poll workers were not adequately trained and supervised. "Since this happened to me once several years ago, I can easily understand the frustration of many voters," Rodriguez said, "and thus strongly feel that the procedural ignorance of many poll workers needs to be addressed." Even Mayor Giuliani, who has not put voting reform at the top of his list of priorities until this past summer, recently called for doing away with the current system. "Maybe people should have taken my advice a long time ago and done away with the Board of Elections," Giuliani said. "The reality is the Board of Elections is selected by the county leaders of both political parties. And it's never been a particularly effective organization." Restructuring the Board of Elections would take a change in the state constitution. And while many are pushing for new voting machines as a starting point, that too, could take years or more, especially considering the cutbacks that are expected in the state budget after the September 11 terrorist attacks. In the 2000 elections, New York City had more uncounted, undercounted and spoiled ballots than the state of Florida. With the current system, many believe it is only a matter of time before New York City becomes the new capital of voting mishaps.